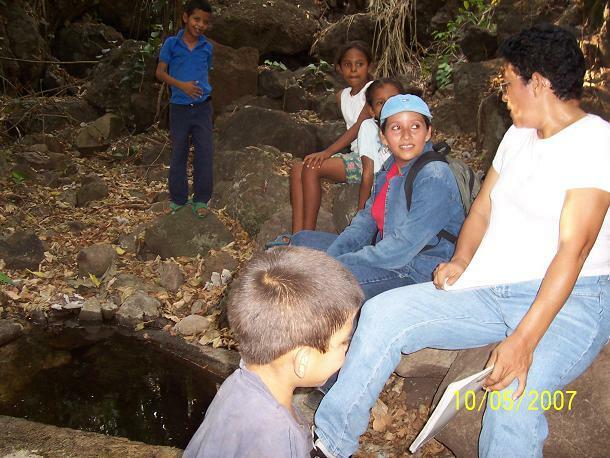 Since 1990 El Porvenir has partnered with over 375 poor communities in Nicaragua to improve their lives and health through self-help sustainable community development. We have completed over 650 small-scale water and sanitation projects to date. Infrastructure projects are accompanied by community-based reforestation and community health education. El Porvenir does not initiate projects. A community must identify their need, come to El Porvenir to ask for help, elect a committee, provide all labor on a volunteer basis, and contribute any locally available materials. El Porvenir field staff provide materials which must be purchased, and give technical assistance and training to enable the community to construct the project and then undertake its long-term maintenance. A water system will be rehabilitated in Bálsamo, San Lorenzo, there are 31 families and 145 people. The water system is so deteriorated though, that the cost of the water system is similar to a new water system. 29 latrines will be built in Bálsamo, San Lorenzo. In 29 households, there are 31 families and 145 people. All beneficiaries will receive hygiene and sanitary education, training in long term maintenance of projects, and the opportunity to take part in reforestation of microwatersheds in their communities. More details below. The water system involves 2 spring captures, directed into a round brick and cement tank. Latrines are the standard (standard for Nicaragua at this time, although this may change in the near future as we are investigating other options) VIP single pit latrine. The shells are made of zinc and metal, so as to be easily reused when the first pit fills. Usually the communities are organized even before applying to El Porvenir for a project. (El Porvenir does not undertake any project unless we receive a handwritten request from the community). If the community does not have Potable Water Committee (CAP) then other existing structures (if any) in the community are viewed to see they want to become the CAP for their community, otherwise a new committee is created. The community is trained in community organizing technique and committee functioning. Community ownership is felt by the community through its identification of its problem, and their involvement in the sweat equity of the project. All water project areas are legalized before beginning any construction. After project construction, water project communities are invited to participate in reforestation. Those who want to do so will develop seedling nurseries in Jan-March, transplant in the rainy season May-June, and maintain the plantations under barbed wire fence and "no burn" protection for three years minimum. Reforestation project includes construction of fuel-saving, smoke-free stoves in the homes of the best reforestation participants (and eventually others). Community health educators will visit all projects after construction to teach hygiene (handwashing e.g.) and encourage ongoing maintenance and repair of all projects, strengthen local committees, etc. Also, Community Agents will be trained to directly and more frequently reinforce the hygiene messages. The Community Agents are trained using a train-the-trainer methodology. We are reviewing our monitoring and evaluation system at this time and hope to come up with more comprehensive indicators over time. Currently we collect health data from the nearby health posts and monitor the incidences of diarrhea and other watsan related illnesses. The community has agreed that each member will pay a quota each month according to the consumption that the water meter reads (minimum 15 córdobas plus consumption over X cubic meters - X to be determined by the committee). This amount will go to the maintenance fund which will be maintained by the treasurer and will be put into a bank account if it reaches 1,500 córdobas (U$82). El Porvenir will assist the community in opening a bank account if necessary. There is no bank in San Lorenzo, the nearest branch bank is in Boaco about 27 km away. 9. Transport of materials to the various locations where the work was carried out. The total time worked by the community in carrying out this Project will be approximately 400 person-days with a value of approximately US$3.33 per day (wages generally paid in rural area for manual labour) for a total of US$1332. The community will also provide lodging and food for the technical and skilled workers throughout the project development and execution, at an estimated value of 6,500 córdobas or about US$333. Please may you explain what type of materials will be transported by the community and what type means of transport are they going to use? How far from the project location and the source of materials you are talking about? What will be the role of the government leaders in the concerned area on Maintenance Fund? Who are responsible of selecting the members of the committee? . You have said if the money is less than USD.82 will not be banked, how are you going to monitor a treasurer who will be staying with all fund less than USD.82? What will happen if he or she will be tempted to use part the fund for his or her family? The proper way is to bank the money regardless the amount. The materials used in this gravity flow water system are: PVC tubing, water meters, glue, etc. for the main line and distribution network. For the tank and the spring capture: cement, iron rebar, bricks, sand, as well as a metal entry door for both. The source of the materials varies. Most things are available within 20km of the village in San Lorenzo (4km) or Boaco (20km), including the PVC tubing, however, the PVC tubing is cheaper in Managua, 140km (more or less) and even with the transport, we generally purchase the PVC in Managua. When transporting from Managua, we use our 4x4 truck, or seek trucks that are going that route anyway. Locally, we hire local 4x4 trucks. We liaison with the municipality, but they have no official role in the project, although they often direct needy communities to us. The members of the committee are democratically elected by the community. Our staff are often invited to help facilitate the elections. The committee members are all taught to keep records and can keep tabs on each other. The treasurer is expected to report on the records each month. The bank account unfortunately cannot be opened until they have this amount. I believe this is a prerequisite in the bank for opening the account, they need to have collected this minimum amount. Whether the fund is in the bank or under the mattress at home, the temptation and means are there for corruption. Having the money in the bank is no guarantee, since the treasurer will be the one depositing and withdrawing money. We have not experienced problems of this sort, that I know of, and we are in contact with these communities for years after the infrastructure is built. The more common problem is that some people stop paying or abusing the system. Another nice project and looks like it is very much needed. Do you have any photos of the water sources they are forced to use currently? Do you have any interviews regarding the current water supply and its deterioration and history? Do you have any photos of the water sources they are forced to use currently? Do you have any interviews regarding the current water supply and its deterioration and history? "The woman's responsibilities are the domestic chores, care, raise and educate the children, also support their husbands in planting and harvesting. Daily we cook, clean and carry the water from the spring when there is not enough [in the tank/system]. In the dry season, we spend 4-5 hours carrying water but in the rainy season it arrives to our homes." I do know that the original water source for this system dried up and thus the community bought some hoses and jury-rigged a system from the water source shown in the photo several years ago. However, even this water source is not enough for the whole community and another needs to be added. The hoses are connected with strips of rubber, which leak a great deal. The El Porvenir approach has proven his effectiveness in organising people for their access to water and basic sanitation. Project file is clear and exhaustive. With respect to mainenance I wonder if those small communities are technically and financially in the position to sustain their water devices on the long run. In other countries PROTOS (and other NGO's) works on "second degree" associations of water user committees or on a cooperation between communities and local government for more complex items of long run sustainability, such as yearly tecnical and financial audits of the local water users committees and infrastructure, a commun emergency fund for big rehabilitations and so on. Is this an idea for rural areas in Nicaragua ? With respect to maintenance, that is an ongoing debate here, and I imagine in other countries. We, at the current time, do not do any sort of audit on the community committee, but we do have ongoing follow-up with our education program, often for 1-2 years after the infrastructure has been put in place, that helps the committee stay on track with their quota collection and maintenance. That quota does go to a community fund for short and long term repairs. As for a fund to pay for audits, we haven't thought of that, do you mean that the local community fund pay for an audit or that we look at a network of committees (is that what you mean by second degree?) or perhaps a municipal connection to help with audits? We haven't worked on any networks of committees, but I have heard of other programs. A sub-goal of our current community agent program (train the trainer methodology to expand our hygiene education reach) is to look at options for networking between communties and committees. Maybe we can look at incorporating something in that vein when the agent program gets going.. I know Water for People works with the municipal government, but not sure they have done any auditing. Is Ned in this group? What I meant with the "second degree" is a kind of "supra-local" organisation that can be responsible for more complex actions, such as the audits, an emergency fund or others things that can not be done on the isolated level of each community - remember the limits of the VLOM-experiences. The "second degree" can be a formal network of water committees, a cooperation between water committees and the local/provincial authorities or a cooperation with a local private service provider (sound experiences exist in Burkina). OK, great, thanks Stef, then I did understand your question. Let me know if that answered your questions. Thanks for your answer regarding the networking of water committees. I invite you for further reading on the PROTOS's experiences on Junta de Agua networking in Ecuador to see the PROTOS-website (www;protosh2o.org) - Spanish version - under the Ecuador programme; or get in contact with pablo.martines@protosh2o.org in Cuenca, Ecuador. Main topic is to look for a sound distribution of roles and responsibility between local government, the (small) communities and their "secundo grado" networks. Again the same question about the sustainability of the sanitation model. Is there a way the people can afford a new latrine when the current one fills up? I have not seen a model where either there is a dual-pit or whether funds/subsidies are used to construct. Is there a way the people can afford a new latrine when the current one fills up? I have not seen a model where either there is a dual-pit or whether funds/subsidies are used to construct. As per my understanding there is no individual contribution to the latrines, correct? After seeing a few places with a 2nd latrine next to the first full one and that requiring a complete donation, i would urge you (if my assumptions are right) to introduce a more financially and operationally sanitation strategy. The EMW project (which i have asked EP to review) is another approach. Of course, eco-san, dual-pit are also technologies that need to be investigated. Rob--- would you describe the latrine you are working with? In your explanation you mentioned that you were using zinc. Is this the type of latrine that has three distinct portable parts such as a cement slab base; pot; and portable cabin with zinc roofing materila for sides that can be moved to a new site when first pit is full? I think we are using a latrine model similar to yours, except that the latrine frames we have changed from wood and zinc to a metal frame and zinc. This is exactly the reasoning for the change, that you mention, to be able to moved to a new site. We found that the wood frames rotted quickly here in the tropical setting and/or were infested with termites. The idea is that the latrine shell is recycle-able or reusable. The cement slab base and pot (bench) is also reusable if they are careful when they remove it. We encourage them to not use too much cement to stick the slab on the blocks or bricks lining of the pit, thus it can be carefully removed. By the way, sorry for the delay on responding this week, I was travelling and you know it is more complicated that way. We do have a dual pit model we are experimenting with. I would have put that project on PWX, except I already had funding for it, also it is much more expensive. We have not yet come up with a funding model for Nicaragua, but we are looking at some options. One is if people have an existing latrine, to ask them to rehabilitate it before initiating a water project. This is something we will be looking at with WFP in the region that they are funding here in Nicaragua. We are also doing a study in the next few months to see how much it will cost to pump the sludge out of older latrines. This could be quite expensive, especially for latrines that are far into the rural areas and inaccessible. We are also investigating eco-san, we are going to visit a project in El Salvador that successfully used eco-san. Many eco-san projects have failed in the past in Nicaragua, so we wish to learn more about what works before experimenting with that. We are moving a bit slowly on changing our sanitation model (which is the government standard here in Nicaragua), but we do want to explore all the options before deciding our course forward. Nicely thought out project approach and costs seem appropriate. A good, clear and well thought out proposal. The ideal of the project is good.To make the project sustainable is very important. Good mechanism of monitoring the fund is needed as the fund will not be Banked until it reaches a certain amount. This project includes elements that impress me. (1) Appropriate technology such as rope pumps and simple latrine designs that are mobile. (2) The costs are well within my experience for these technologies. Sufficient water and confinement of human waste coupled with health education are key factors in health management of small , rural, stressed communities. People who are hungry, jobless, and ill have little motivation for complicated solutions. This is a very good example of keep it simple and cost effective. The funding by donors of long term health education ( more than 4 years) in these communioties would add greatly to the multiple effects of installing facilities such as water systems and latrines. Changing attitude in hygiene is a long term process of repetitive activity in a positive educational experience. These long term hygiene projects should be part of the discussion for future funding. Good project. Reasonable cost per capita. Involvement of different local stakeholders. Good integration of hygiene and sanitation topics. Just one thing: water users have rights and duties and should be organized at different levels to claim these rights and distribute tasks and responsabilities to implement their duties. I wonder if El Porvenir works enough on this topic. I like this project (though its not quite a rehab) and EPs approach. However, my only concern is the cost per beneficiary which comes out to $96 for the water part.